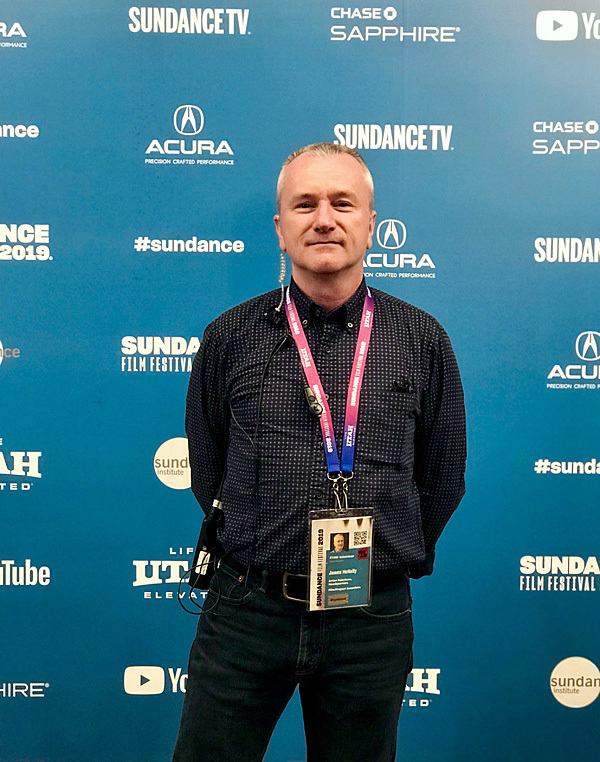 Director of Programming James McNally is attending this year’s Sundance Film Festival from January 22nd to February 3rd. The venue was new this year, the Utah Film Studios, and we were using one of their three soundstages. They had two food trucks parked inside, along with pool tables and pinball machines and arcade games. I was able to circulate for a while, giving out extra drink bracelets to our film teams, and making sure everyone was having a good time. I had a good conversation with Alma Buddicke, the director of Hot Dog. Her film team were one of the most fun to work with this year. Sometime around midnight, Bobby and Sophie (the Artist Relations Liaison for US Documentary and Midnights) grabbed me and said we were leaving to go to another party. A short Lyft ride later, we were at a house near the Library Theatre, where the Rooftop Films team were hosting a small party. I saw my TIFF/Hot Docs friend Dorota Lech, and finally met someone I’ve been Facebook friends with for ten years but hadn’t yet met. Danielle DiGiacomo does acquisitions for The Orchard, and is a New Yorker transplanted to LA. We may be able to meet up when I’m there next week. I also met Rooftop artistic directo Dan Nuxoll and spent a lot of time talking to Maria Rhodes, their Festival and Programming Coordinator. They’ve been doing amazing work in New York City for more than twenty years and I’m desperate to actually attend a screening (the one I did attend in 2013 was eventually rained out). I didn’t leave until nearly 3:00am but luckily I had only about a five minute walk to get home. First of all, if I met you at the festival-filmmaker “speed dating” event at Slamdance this afternoon, welcome! The site doesn’t always look like this. You can click here to see what our festival programming looked like in 2018. I got into HQ by around 10:00am this morning and it was very quiet. This is what the rest of the week will be like. I wanted to put in a few hours’ work before noon, when I headed out to the Windy Ridge Cafe for the Telefilm Canada luncheon. There I met up with my friend Mike Lane, a film editor from Toronto. He’s here without a smart phone so we’ve arranged a few meetings by email. 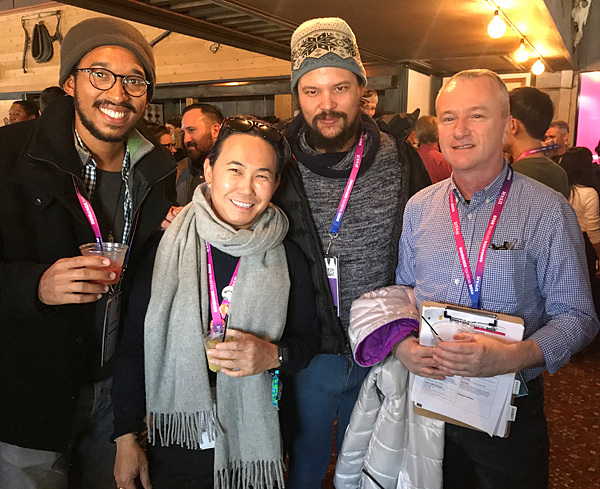 I met a few other Canadians, including an actor from the Slamdance film Happy Face, Hot Docs director Shane Smith, Toronto film critic Jason Gorber, and producer Kristy Neville (from SNP selection Her Friend Adam, among many other projects). I saw the teams from Fast Horse, Throat Singing in Kangirsuk (who did some actual throat singing) and Docking but didn’t get to talk to them. The event was two hours long and it seemed to go by very quickly. I was back in the office from 2:00pm until 4:00pm, when I left for another event. Josh Leake, director of the Portland Film Festival, had put together a great event bringing together festivals (mostly from the Film Festival Organizers group on Facebook) and filmmakers (mostly from Slamdance). It was a really intense but fun session, and I gave away lots of Shorts That Are Not Pants stickers. I also won a great raffle prize, $500 of equipment rental from Eventive, the ticketing platform we already use for our festival. It was nice to meet Eventive’s founder Iddo Patt, as well. I had to run off at 7:00pm to meet Bobby at the Egyptian for our last premiere, the short film Those Bad Things, which was preceding the Uruguayan feature film The Sharks. During the load-in, a nice woman asked me where the jury seats were and it took me a little while to realize that it was Jane Campion. I slept until after 9:00am this morning and didn’t get into HQ until nearly 11:00am. After Bobby and I went over the day’s schedule, he received a message from the filmmakers of End inviting us to join them at the Queer Brunch being held nearby at the Grub Steak restaurant. It was jammed and we weren’t officially on the guest list, but a kind security guy let us in, where we enjoyed a rather-too-early-in-the-morning-for-me cocktail. The event is put on by OutFest, and so I didn’t know anything about it, but it was really packed and very warm. Yimit and Gregorio have been so kind to us so far and are really enjoying their visit to the festival. We also bumped into Trevor and Fish from Docking and since their films are both in the same programme (Midnight Shorts), they spent a lot of time talking together. We could only stay about 30 minutes before we headed off to the Ray Cinema to present the short The Dispossessed before the feature film Midnight Family. The filmmakers were early and were accompanied by Kamau Bilal, whose short Baby Brother charmed me last year. We spent a lot of time talking about Roma, Cuaron’s other films as well as those of Denis Villeneuve. It was great to talk to such a friendly and knowledgeable bunch of guys. They had also brought their producer from Kashmir, who had taken five separate flights to get here. The film premiered today on the New York Times OpDoc site. Check it out! After that we had about an hour break, which we spent at Bobby’s festival-provided lodging which was nearly right across the street from the Ray. We grabbed food at Fresh Market first and had a nice lunch break and a great talk. Around 5:00pm, we grabbed a Lyft and headed to Temple Theatre again for back to back screenings. First was the Animation Spotlight, most of which I got to sit in on. Obon and Octane were noteworthy, and it was great to see Knockstrike again (and to meet and talk to one of the filmmakers). We didn’t have much turnaround time so I got pulled out before the Q&A to prepare for the press line for Shorts Program 3. Oddly, it was their third screening, since we didn’t do the press line at Redstone Cinemas and their second screening was in Salt Lake City. One of the films starred John Leguizamo’s daughter, so he was there to accompany her. 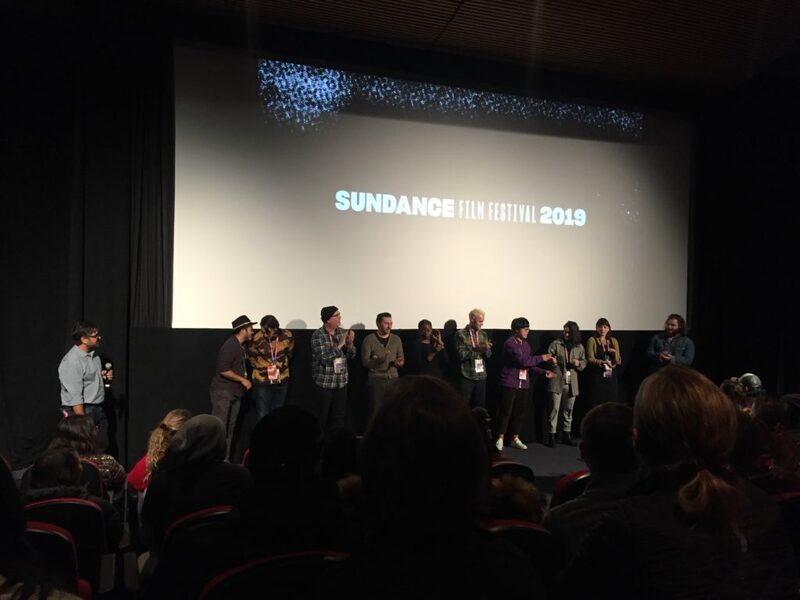 Two of the films were directed by filmmakers familiar to me: Easter Snap is by Ramell Ross, who directed the lovely Hale County, This Morning, This Evening, and Lockdown is by Celine Held and Logan George, whose recent short Caroline premiered at Cannes. Unfortunately, I didn’t stay to watch the films. I hope to catch them later in the week. We wrapped just after 9:00pm and I was back home by 10:00pm writing up the day. Things really drop off tomorrow, so I’m going to attend a few events, including the Telefilm Canada luncheon and a reception for film festivals who are part of the Film Festival Organizers Facebook group. Bobby let me go straight to our first screening venue this morning, allowing me to sleep in a little bit. I met him at 10:30am at the historic Egyptian Theatre on Main Street, where we were presenting the premiere screening of Documentary Shorts Program 1. We just had one filmmaker, Marcin Polar from Poland, premiering his short film The Tough. It was also a mini-Hot Docs reunion as I ran into both Charlotte Cook (now at Field of Vision) and Sarafina Defelice (now at Netflix). Speaking of Netflix, Ted Sarandos was in attendance to watch the final short in the lineup, Life Overtakes Me which will air on Netflix soon. From there we headed back to HQ to figure out the next few days. I got away for lunch at Este Pizza again and then we headed out at 4pm for the premiere screening of Shorts Program 5 at the Temple Theatre. Another smooth experience with the team there and I was off on my own back to the Egyptian to accompany the team from Hot Dog as their short premiered before the feature film Premature. This team were a lot of fun at checkin and they were even more fun tonight. 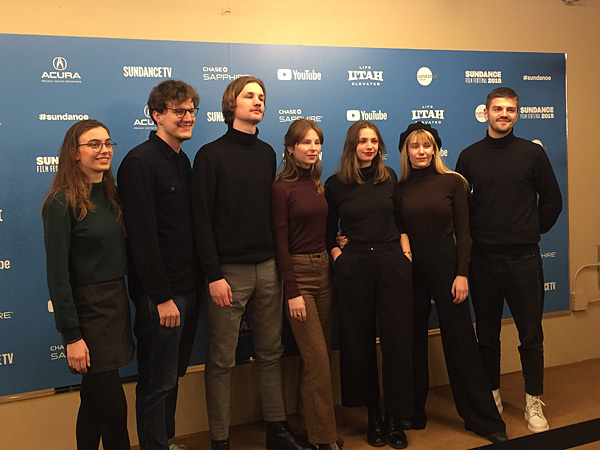 They were originally slated to just get a photo or two after the feature film’s press line but because they arrived early, we were able to take a lot of team and director photos. It helps that everyone on the team is incredibly photogenic and they were stylishly dressed. Only the directors had tickets for the screening though, and the rest of the team asked if they could stand at the back and watch just their short. I politely made the request to the theatre manager and he was gracious enough to allow it, which made the whole team happy. I arrived pretty early for that screening and wandered around a very crowded Main Street for a while. I even went into the Treasure Mountain Inn to check out some of the Slamdance festival stuff, but I didn’t stay long. I don’t really enjoy the crowded and commercial aspect of Sundance, which is centred on Main Street. I made a much-needed stop at Fresh Market and was home by 10pm. And I don’t need to go in that early to HQ tomorrow. Our schedule is starting to lighten up, and that feels good. It makes for more relaxed work, and better interactions with our filmmakers. It’s really gratifying to see them enjoying their Sundance experience. Back in the office at 8am for what might be my longest work day of the festival. I checked in a few more filmmakers before Bobby and I left at 1pm for the premiere of Documentary Shorts 1 at the Temple Theatre. I love the serene vibe at this converted Jewish temple, and all of the filmmakers were a pleasure to work with. I even managed to grab a volunteer ticket and watch the whole lineup. Highlights would include Edgecombe, an impressionistic portrait of three people living in Edgecombe County, North Carolina, Everything You Wanted to Know About Sudden Birth, a hilarious examination of a 1960s police training film, and Stay Close, a multifaceted film about the life of American fencer Keeth Smart. From the Temple, we took a number of shuttle buses to get to the Redstone Cinemas, where we had three screenings very close together. 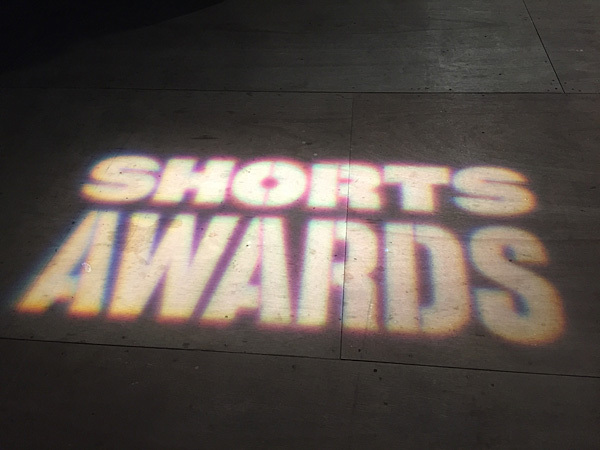 The second screening of Shorts Program 1 was bookended by the first (but not premiere) screenings of Shorts Programs 2 and 3. Traffic delayed lots of our film teams and since these weren’t “premiere” screenings with press lines, there were no reserved seats, meaning some of our late arriving filmmakers didn’t get to sit in their own screenings. Everyone seemed good natured about it and just went for some food or a drink before returning for Q&A. Bobby and I were able to go next door to Ghidotti’s, a very nice Italian restaurant, where I was able to use one of my volunteer “grub stubs” to get an excellent plate of penne bolognese. We decided to take a Lyft back to HQ around 9:30pm so we could prepare for the premiere of Midnight Shorts, which was being held nearby at Prospector. This was a fun one, with two Canadian films (Docking and Chowboys: An American Folktale) and I was pleased to introduce Trevor Anderson to the Astron-6 gang. I even stayed to watch their films since they were first and second in the running order. But fatigue was catching up and so I didn’t stay for the rest of the programme, and was very happy to see my bed around 12:45am. I actually felt pretty good today and even better when realizing it should only get easier from here on in. We’re making friends with the filmmakers and it’s lovely to see them befriending each other as well.